Star-crossed lovers? Check. Wild party scenes? Check. The 1920s aesthetic is just bonus. It's a novel in verse, but it still counts! Cranko's pas de deux work vividly paints the emotional turmoil of Pushkin's characters, such as this sequence in which Tatiana imagines being loved by the haughty Onegin. It's spooky, it's sensational, it's a deep meditation on the nature of humanity—oh, and it's alive. The Brontë sisters had a knack for writing complex, tempestuous relationships—great fodder for pas de deux like this one. Sword-fighting, pirates, pixie dust and a ticking crocodile? This one simply flies off the page. Some would argue that Tolstoy's epic is the greatest literature ever written, but you can't argue with the fact that the titular heroine is a deliciously complex character to tackle. Why is a raven like a writing desk? We still might not know the answer to Carroll's riddle, but we do know that Wheeldon's blockbuster production is so full of incredible moments (like Steven McRae stealing the show as a tap-dancing Mad Hatter) that we had trouble narrowing it down. There's a reason it seemed at one point like every ballet company in America had a production of Dracula in its repertoire. Just in case the dystopian nightmare conjured by Orwell wasn't vivid enough in your own imagination. Happy New Year! Whether or not resolutions are your thing, I always find that a bit of wisdom from the people I admire is a great way to start the year. Here are some favorite nuggets from eight dancers, choreographers and directors who have appeared in our pages over the last year. As a kid, I often had trouble getting any words out the way I really wanted to. I developed a fantasy where I could find each character from each story I read within myself, and use them to communicate. I was always "Evan," but embodying different characters broadened the way I could connect with people. I felt that each character was like an instrument and that communicating effectively required the whole orchestra. Then, when I was 8, I saw John Cranko's Onegin. I hadn't known that dance could develop characters in a way that would resonate so strongly. It was the first ballet that made me want to dive into this life of expressing the human condition through the body. The role of Onegin ended up following me through my career, and it taught me to rely on my humanness. What’s behind the recent comeback of narrative ballets? Everyone loves a good story. They drive our imaginations, teach us life lessons and entertain us. They also warn us not to hold grudges against cradled babies, trust seductive women in black tutus or casually flirt with vulnerable peasant girls. From its historic beginnings, ballet has been a narrative-driven art form, so it’s not surprising that tradition has held fast, even through the era of postmodernism. But the recent proliferation of new story bal­lets, usually full-length, by popular choreographers such as Christopher Wheeldon and Alexei Ratmansky, seems exceptional. 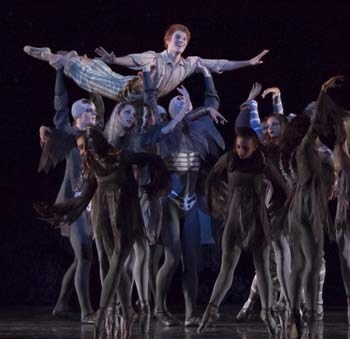 Even choreographers who made careers in abstract works have recently followed the temptation: Peter Martins created the underwater fantasy Ocean’s Kingdom in 2011; Twyla Tharp took on the children’s novel The Princess and the Goblin in 2012; Wayne McGregor collaborated with author Audrey Niffenegger to make The Raven Girl in 2013. And last September, the Joffrey Ballet received a $500,000 challenge grant from the Rudolf Nureyev Dance Foundation towards an endowment specifically for the creation, production and performance of full-length story ballets. But wasn’t Balanchine’s aesthetic—dropkick the libretto and allow the choreography to tell its own story—supposed to have dramatically shifted the focus of American choreography to pure dance? Certainly, over the past few decades, audiences came to expect innovation from the abstract more than from the literal. Few would have predicted evening-long narratives to be the future of ballet. Yet passion for drama is one thing and successfully conveying it is another. Christopher Wheeldon, his global success with pure dance works like Polyphonia notwithstanding, has choreographed a number of full-length ballets: His most recent include Cinderella, Alice’s Adventures in Wonderland and The Winter’s Tale, which The Royal will premiere in April. Wheeldon points out that ballet’s ethereal properties often work against the grounded nature of linear contemporary stories. “Choreographers gravitate to fantasy, escape and romance because these are themes that work in the pointe shoe,” says Wheeldon. “I think it’s more of a challenge to depict modern stories using such a refined and specialized dance form. I’m not saying it can’t be done, but I think it poses more complex problems. You’re more likely to see a contemporary dance choreographer tackle themes of today.” For Wheeldon, a return to stories means that new ballets often have more in common with Tchaikovsky’s fairy tales than they do with the gritty contemporary realities audiences typically see in other art forms today. According to Neumeier, just as in translating texts to another language, the worst kind of story ballet is a word-for-word translation to the stage. He thinks it’s necessary to find “blocks of structure and to invent a parallel world.” When Neumeier begins working on Tatiana based on Eugene Onegin, which premieres this June, he won’t be discussing with the dancers what Pushkin said about Tatiana or Onegin. “When I’m making a story ballet, it’s not retelling the story, or acting out in movement the text of the prose, but actually doing a ballet about my reaction to that piece,” says Neumeier. “Translating it into a wordless medium means I have to take liberties with it. I have to find a form that will convey something that’s immediate, something of today.” Depending on the choreographer, that can result in solipsism or ingeniousness. It seems that story ballets are here to stay. So how can they dodge Disneyfication, eschew schlocky themes, avoid portraying women as victims and stay relevant to today’s culture while representing people and circumstances that are recognizable and riveting? Perhaps with a blend of live onstage musicians, actors and dancers, suggests Ochoa, the story-ballet form can become more flexible. Commissioning new scores and including teams of all types of artistic talent, as did Diaghilev’s Ballets Russes, could potentially keep things fresh. How about a Hitchcockian ballet thriller set to the music of Bernard Herrmann? Or diving into the realm of magical realism with something along the lines of the fantasy-driven film Pan’s Labyrinth? The possibilities are only limited by imagination. Joseph Carman is a senior advising editor for Dance Magazine. Mark Morris Dance Group is plenty busy this month, headlining Luminato, Toronto’s annual arts festival, with Morris’ masterwork L’Allegro, il Penseroso ed il Moderato in its Canadian premiere June 21–23. Morris directs this year’s Ojai Music Festival (the first choreographer to do so), where his dancers will perform; and at Ojai North!, a collaboration with Cal Performances in Berkeley, MMDG will premiere Morris’ Rite of Spring, danced to a new arrangement of Stravinsky’s music by The Bad Plus jazz trio. www.luminato.com and www.ojaifestival.org. MMDG in L’Allegro, il Penseroso ed il Moderato. Photo by Elaine Mayson, Courtesy Luminato. 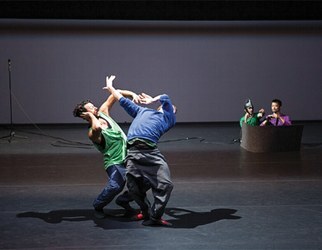 Two daring dancemakers return to this year’s Festival TransAmériques in Montreal. Lemi Ponifasio brings Birds with Skymirrors, in which frenetic limbs contrast with intense stillness. At 54, the indomitable Louise Lecavalier performs So Blue, a whirlwind solo and duet for which she receives her first sole choreographic credit. May 29–June 7. www.fta.qc.ca. Lecavalier in So Blue. Photo by André Cornellier, Courtesy FTA. This year marks John Neumeier’s 40th anniversary at the helm of Hamburg Ballet. To celebrate, the company has expanded its annual summer festival Hamburg Ballet-Days. HB will dance in 16 productions over the three weeks, joined by its school and two guest troupes led by former company dancers: Ivan Liska of Bavarian State Ballet and Jean-Christophe Maillot of Les Ballets de Monte-Carlo. While companies all over the world have been feting the centennial of The Rite of Spring, Neumeier, whose personal collection of Nijinsky memorabilia is legendary, has dedicated several evenings to his idol/muse. June 9–30. www.hamburgballett.de. Neumeier rehearsing Carsten Jung in his Liliom. Photo by Holger Badekow, Courtesy HB. A free series of site-specific performances around San Francisco, presented by Dancers’ Group/ONSITE, honors a local pioneer this month. Amara Tabor-Smith, a former associate artistic director of Urban Bush Women who now directs Oakland-based Deep Waters Dance Theater, pays tribute to her mentor, choreographer Ed Mock, an AIDS casualty in the 1980s. June 15–23. www.dancersgroup.org. Amara Tabor-Smith. Photo by Alan Kimara Dixon, Courtesy Tabor-Smith. Twenty years after his death (and 75 after his birth), Rudolf Nureyev’s impact on ballet is still felt worldwide. Tributes to the unrelentingly charismatic star have been happening all year, and this summer brings still more. In addition to a gala at the Vienna State Opera Ballet at the end of the month and a production of his Swan Lake at Teatro alla Scala later this summer, Le Palais des Congrès de Paris hosts the Noureev and Friends gala May 31–June 1. The fabulous lineup of today’s stars come from companies like the Bolshoi (Obraztsova), the Mariinsky (Kondaurova and Somova), and English National Ballet (Rojo). www.viparis.com. 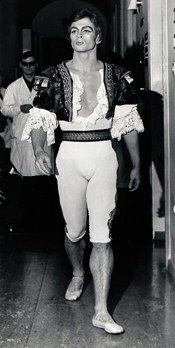 Nureyev in costume for Don Quixote. Photo by Serge Lido, DM Archives. Three enduring goddesses of downtown dance—Sara Rudner, Vicky Shick, and Jodi Melnick—come together at The Yard June 22–30. Each one alone is glorious to behold, but together they’ll be an irresistible pileup of brainy female sensuality. Also on the agenda at Martha’s Vineyard’s largest dance festival: Faye Driscoll (see “Word Play,” April), Doug Elkins, Everett Dance Theatre, and Deborah Lohse (see “Nine Who Dared,” Nov. 2012). Without a doubt, The Yard, now helmed by former DTW chief David White, is undergoing a major revitalization. www.dancetheyard.org. Melnick. Photo by Matthew Karas. William Forsythe’s approach to ballet technique was revolutionary in the 1980s. His style is still often imitated, never matched. In recent years, with his own Forsythe Company, he has moved into the realm of dance theater—where whimsy and crazily delicious dancing play equal roles. His latest piece, which comes to Sadler’s Wells this month, aims to cover it all. Study #3 incorporates movement sequences, choreographic methods, music, costumes, and technical effects from 30 works spanning the last 30 years. www.sadlerswells.com. The Forsythe Company in Study #3. Photo by Dominik Mentzos, Courtesy Sadler’s Wells.